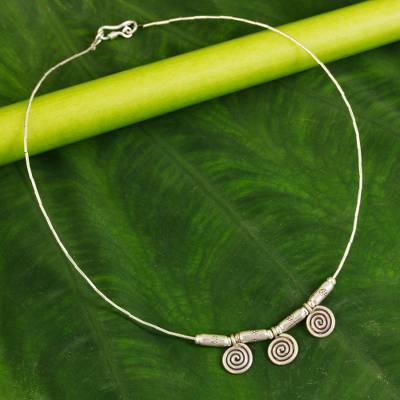 Hill Tribe Silver Choker, "Secret Circle"
Inviting meditation, silver spirals engage the eye and mind. Sasithon Saisuk translates ancient Lanna (northern Thai) design motifs into contemporary jewelry. The pendants dangle from a silver chain, crafted by hand. Sasithon Saisuk has received 4 microcredit loans with 0% interest from Kiva and Novica, the first for $2300 and the most recent for $1100. Proceeds were used to stock up on raw materials for her handcrafted jewelry and fashion accessories. It's beautifully designed and made. Exquisit. "It is the melding of art and local beauty expressed in the combination of materials." "Hello. I'm Sasithon Saisuk or you can call me Eaw, my nickname. I was born on April 30, 1968 and have two older sisters. My personality is optimistic, rejoicing, forgiving and never malicious. Although I can get angry easily, I calm down very quickly. When I was young, I was a shy girl and always obedient. "After I finished high school, I worked for a newspaper with my sister, who is a journalist. But we couldn't separate our work and family relationships, so I returned to my hometown. I had a chance to study Thai dance and music, and in 2000 I began working at the school. It focuses on local intellectual methods and here I found an opportunity to do the things I truly love. I performed northern Thai regional dance and in addition I learned to make jewelry. It is the melding of art and local beauty expressed in the combination of materials. "Silverwork is a regional tradition. I design the patterns for this kind of jewelry and adjust it to suit both local and contemporary clothing styles. "I have recently begun experimenting with new materials, and I especially enjoy working with coconuts. First I used them to make jewelry, but then I started to explorre crafting other items, such as belts, handbags, etc. "I feel very proud of my work because I design it myself, I choose the materials, compose it and finally the piece becomes real. That's why I love it, and I hope my jewelry will be loved by everyone." Saisuk crafts her work by hand. When working with silver, she first melts the silver-copper alloy in a crucible and decants it into a terracotta mold. After it hardens, she begins the painstaking task of sculpting the details of each bead, charm and pendant. I purchased this item for my grandmother for an after-Christmas present (long story.) She has always been into unique, artisan style jewelry and I saw this and immediately thought of her. I could not believe the pricing on such a beautifully crafted, hand-made piece...and once you get it home, it gets even better! It looks more wonderful in person and feels so nice on the hand and skin. Grandma loved, loves, and adores this piece! Thank you! I purchased a coconut shell shoulder bag, earth roses. And i really, really like it! I love it! Thank You very much for making such a good thing to me! I have purchased several works of beautiful jewelry from Sasithon. She does such beautiful work in tiny precision. I'm in love with her circles, they make me feel calm and help me meditate. Sasithon is a wonderful artisan.